I'm pretty sure that most people I interact with are addicted to caffeine. I certainly am. A subset of us sometimes like our caffeine to be in the form of a fancy "caffe latte" with the primary ingredient being milk of the steamed variety. In order to get our daily fix we must find our way to a coffee shop or stand. To get our fix, we give up hard earned dollars for what amounts to a lot of milk with a little bean juice and maybe some flavored sugar water for an extra fifty cents. Here's a guide to break the dependence on a 3rd party for your latte since that stuff is super cheap. Espresso machines come in a few flavors. The crappy, not worth your while kind. The ridiculously expensive kind that only a crazy person or business would seriously consider. And then there's the Delonghi EC155 espresso machine, which can be yours for $90, or roughly 21 lattes. It makes a good espresso, steams milk just fine, and lasts forever. It's very well reviewed by the people in a very hard to please demographic, latte-drinking, hippie liberals. We had one that crapped out after 10 years of service. After much research, I was surprised to land on the exact same machine...which is still in production after a million years...because it is awesome and cheap. 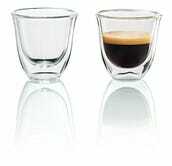 3.6 lattes: 2x Espresso Cups - Where your espresso goes after it leaves the machine. The machine doesn't come with any so you'll need some. 3.4 lattes: 20 oz Frothing Pitcher - IMPORTANT: You really want plenty of space for the milk to expand as it is steamed. Do NOT get a 12 oz one. Just don't. It's not big enough. I had a 12 oz one forever and I switched to this one and my lattes got much, much better because I wasn't battling it all the time. This one is a good fit for the machine as the machine's frother is a on the low side, so you can't fit a really tall pitcher. This one fits well enough as long as it's not brimming with milk. 1.6 lattes: Tamper - It does a better job than the one attached to the machine, which is weird, but seriously, this makes it way easier to actually make good espresso. Worth it. 3.9 lattes: Basic grinder - This will likely get me in trouble, but I use a standard blade grinder. Any dark roast coffee will do, you don't need 'espresso roast' for a good latte. Espresso roast is the same as other roasts, just a little darker. We usually get a decent french roast from the local coffee shop. 4.3 lattes: Travel mug - Because sometimes you don't want to have to chug your latte before it goes cold. Per drink, by my math, the actual coffee and milk in a latte works out to about $0.32 in milk, $0.35 in coffee based on the price of milk and coffee from my grocer and a 13g double shot. The vanilla syrup is ridiculously easy to make yourself for the cost of a few drops of vanilla extract, a cup or so of sugar, and some water. Look it up. ~50 lattes for the complete setup, as long as you take into account the cost of coffee and milk per drink. So you have the tools now, but you need to learn to use them properly. There are countless videos that go into the process of using an espresso machine. Watch a few. If you're going to do this, make sure to check some of them out. It takes a while for the machine to warm up (a few minutes). Wait a minute in between if you're making a few lattes back to back to let the machine warm back up. On this machine, warming up the steamer and the espresso extractor are pretty much the same thing. If one is warm, the other is too, so don't worry about switching from the steamer straight to extracting your espresso. Make a latte in this order: Steam milk, extract espresso, pour a smidge of steamed milk in mug to warm it if it's not warm, pour in espresso, pour in rest of milk. This is the order so it mixes properly and you don't make the espresso too bitter by cooling it down too fast. It takes me about 3 minutes to make a latte or roughly half as long as waiting in line at Starbucks. Steam milk to, but do not exceed, 140F. If you go above 140, you'll burn the milk and it'll taste funky. To produce the foamy latte head, keep the steamer head just under the surface of the milk so you hear a bit of a hiss, but not a gurgling bubble. You'll need to experiment a bit until you can get it right a majority of the time. If you have enough foam, just put the steamer head further into the milk and it'll slow the rate of bubble creation. Tamp your coffee firmly and spin the tamper a bit before removing. Don't go crazy on it or the steam/water pump will not be able to get the steam through the coffee. When extracting the espresso, if it is coming out too runny with no crema, you need to either grind your beans finer or tamp more. If it takes forever for the coffee to start (more than a few seconds), then you either have ground your beans too finely or tamped too hard. Alternatively, the machine could be out of water, in which case, say you're sorry and fill the water reservoir. Stop extracting the espresso a second or two after it turns whitish and clear. It starts getting bitter at the end. Throw away your single shot sized coffee holder for the espresso machine. You'll never use it. Why? Why would you use it? Double shot or bust. Single shot is a waste of time. I think a tall or grande latte has a double shot of espresso. Don't skimp on the frothing pitcher or thermometer. When dumping out your coffee, when banged on the side of the trash can, the tamped coffee paddy should fall out as one piece. If it breaks apart or won't come out, the tamp/grind was probably off a bit. If it's all soggy and runny, the grind was probably too coarse or the machine wasn't warmed up enough. Clean everything out immediately. Dried milk foam is the worst. Let the steam frother run for a second after you've removed the milk jug while the machine is still hot. Some milk can back it's way up the tube. If you don't want to do any of this, you can get pretty close with an Aeropress and a handheld milk frother for a lot less. Enjoy your sub $1 latte, my friends.